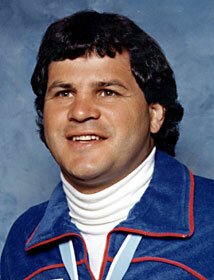 Mike Eruzione earned his stripes as a legend in U.S. hockey history when he captained the 1980 U.S. team to a Gold Medal on home ice. “Do you believe in miracles?” Al Michaels, as the USA defeated the USSR at the 1980 Lake Placid Winter Games. Though he didn’t go on to a long NHL career like some of his 1980 Olympic teammates, Mike Eruzione cemented his reputation as a clutch player by scoring the winning goal against the U.S.S.R. in the Lake Placid Olympic semi-finals. Before that stunning upset made the team members national heroes, Eruzione was a standout forward with Boston University. A four-year star there, he was an all-conference defensive selection and left the college as the third-leading scorer in the program’s history. A consummate team player, his squad won the Eastern Collegiate Championship each year he played at BU.